For other uses, see Agape (disambiguation). "Divine Love" redirects here. For the album by Leo Smith, see Divine Love (album). For the 2019 film, see Divine Love (film). Agape (Ancient Greek ἀγάπη, agapē) is a Greco-Christian term referring to love, "the highest form of love, charity" and "the love of God for man and of man for God". The word is not to be confused with philia, brotherly love, or philautia, self-love, as it embraces a universal, unconditional love that transcends and persists regardless of circumstance. The noun form first occurs in the Septuagint, but the verb form goes as far back as Homer, translated literally as affection, as in "greet with affection" and "show affection for the dead". Other ancient authors have used forms of the word to denote love of a spouse or family, or affection for a particular activity, in contrast to eros (an affection of a sexual nature). Within Christianity, agape is considered to be the love originating from God or Christ for humankind. In the New Testament, it refers to the covenant love of God for humans, as well as the human reciprocal love for God; the term necessarily extends to the love of one's fellow man. Some contemporary writers have sought to extend the use of agape into non-religious contexts. The concept of agape has been widely examined within its Christian context. It has also been considered in the contexts of other religions, religious ethics, and science. There are few instances of the word agape in polytheistic Greek literature. Bauer's Lexicon mentions a sepulchral inscription, most likely to honor a polytheistic army officer held in "high esteem" by his country. A journalist in Time magazine describes John 3:16 as "one of the most famous and well-known Bible verses. It has been called the 'Gospel in a nutshell' because it is considered a summary of the central doctrines of Christianity." The word agape received a broader usage under later Christian writers as the word that specifically denoted Christian love or charity (1 Corinthians 13:1–8), or even God himself. The expression "God is love" (ὁ θεὸς ἀγάπη ἐστίν) occurs twice in the New Testament: 1 John 4:8,16. Agape was also used by the early Christians to refer to the self-sacrificing love of God for humanity, which they were committed to reciprocating and practicing towards God and among one another (see kenosis). Agape has been expounded on by many Christian writers in a specifically Christian context. C. S. Lewis uses agape in The Four Loves to describe what he believes is the highest level of love known to humanity: a selfless love that is passionately committed to the well-being of others. The Christian use of the term comes directly from the canonical Gospels' accounts of the teachings of Jesus. When asked what was the great commandment, "Jesus said unto him, Thou shalt love the Lord thy God with all thy heart, and with all thy soul, and with all thy mind. This is the first and great commandment. And the second is like unto it, Thou shalt love thy neighbour as thyself. On these two commandments hang all the law and the prophets." 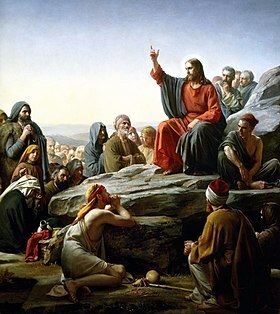 (Matthew 22:37-40) In Judaism, the first "love the LORD thy God" is part of the Shema. You have heard that it was said, 'You shall love (agapēseis) your neighbor and hate your enemy.' But I say to you, Love (agapāte) your enemies and pray for those who persecute you, so that you may be sons of your Father who is in heaven; for he makes his sun rise on the evil and on the good, and sends rain on the just and on the unjust. For if you love those who love you, what reward have you? Tertullian remarks in his 2nd century defense of Christians that Christian love attracted pagan notice: "What marks us in the eyes of our enemies is our loving kindness. 'Only look,' they say, 'look how they love one another' " (Apology 39). Anglican theologian O.C. Quick writes that this agape within human experience is "a very partial and rudimentary realization," and that "in its pure form it is essentially divine." 2 Timothy 4:10— "for Demas hath forsaken me, having loved [agapēsas] this present world...". John 12:43— "For they loved [ēgapēsan] the praise of men more than the praise of God." John 3:19— "And this is the condemnation, that light is come into the world, and men loved [ēgapēsan] darkness rather than light, because their deeds were evil." Karl Barth distinguishes agape from eros on the basis of its origin and unconditional character. In agape, humanity does not merely express its nature, but transcends it. Agape identifies with the interests of the neighbor "in utter independence of the question of his attractiveness" and with no expectation of reciprocity. The word agape is used in its plural form (agapai) in the New Testament to describe a meal or feast eaten by early Christians, as in Jude 1:12 and 2nd Peter 2:13. Mettā, Pali word (Sanskrit: Maitrī), "loving-kindness" or "friendliness"
Ishq, Arabic word, "divine love" or "lustless love"
^ H. G. Liddell; Robert Scott (October 2010). An Intermediate Greek-English Lexicon: Founded Upon the Seventh Edition of Liddell and Scott's Greek-English Lexicon. Benediction Classics. p. 4. ISBN 978-1-84902-626-0. ^ Henry George Liddell; Robert Scott (1901). A Lexicon Abridged from Liddell and Scott's Greek-English Lexicon. Oxford : Clarendon Press. p. 6. ^ "agape." Encyclopædia Britannica. Encyclopædia Britannica Online. Encyclopædia Britannica, 2011. Web. 17 Sep. 2011. ^ Oord, Thomas Jay (December 2005). "The love racket: Defining love and agape for the love-and-science research program" (PDF). Zygon. 40 (4): 919–938. doi:10.1111/j.1467-9744.2005.00717.x. ^ Oord, Thomas Jay (2010). Defining Love: A Philosophical, Scientific, and Theological Engagement. Grand Rapids, Mich.: Brazos Press. ISBN 1-58743-257-9. ^ Nygren, Anders ([1938–39] 1953). Eros and Agape, Part I: A Study of the Christian Idea of Love; Part II The History of the Christian Idea of Love, trans. P.S. Watson. Harper & Row. ^ Templeton, John (1999). Agape Love: Tradition In Eight World Religions, Templeton Foundation Press. Description. ^ Grant, Colin (1996). "For the Love of God: Agape". Journal of Religious Ethics. 4 (10): 3–21. JSTOR 40016679. • Post, Stephen G. "The Tradition of Agape," ch.4, pp. 51–68. • Browning, Don S. "Science and Religion on the Nature of Love," pp. 335–45. ^ Danker, Frederick William (2001). A Greek-English Lexicon of the New Testament and Other Early Christian Literature. University of Chicago Press. ^ Kreeft, Peter. "Love". Retrieved May 22, 2009. Lewis, C. S. (June 5, 2002) . The Four Loves. London: Fount. ISBN 0-00-628089-7. ^ Quick, O.C. Doctrines of the Creed, Scribners, 1938 p. 55. ^ Church Dogmatics IV.2, as translated by G. W Bromiley (1958), p. 745. Drummond, Henry (1884). "The Greatest Thing in the World". Address first delivered in Northfield, England. Heinlein, Robert A. (1973). Time Enough for Love. New York: Ace Books. ISBN 0-7394-1944-7. Kierkegaard, Søren (1998) . Works of Love. Princeton: Princeton University Press. ISBN 978-0-691-05916-7. Oord, Thomas Jay (2010). The Nature of Love: A Theology. St. Louis, Mo. : Chalice Press. ISBN 978-0-8272-0828-5. Look up agape in Wiktionary, the free dictionary. 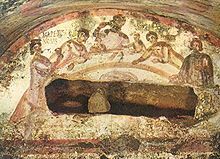 Wikimedia Commons has media related to Agape feast. "Agape" at Balashon—Hebrew Language Detective. Retrieved 10 January 2019. Deus Caritas Est—Former Pope Benedict XVI's 2005 encyclical letter contrasts agape and eros. Retrieved 10 January 2019. Study Love - An exhaustive, non-denominational breakdown of the itemized Christian definition of agape in 1 Cor. 13:4–7. Retrieved 10 January 2019.